Sometimes, to find the best cat litter, you have to check out what everybody else is buying. After all, if a particular brand is popular with other cat owners, there’s a reason. This is particularly true for websites like Amazon where you can check reviews before deciding to make a purchase. 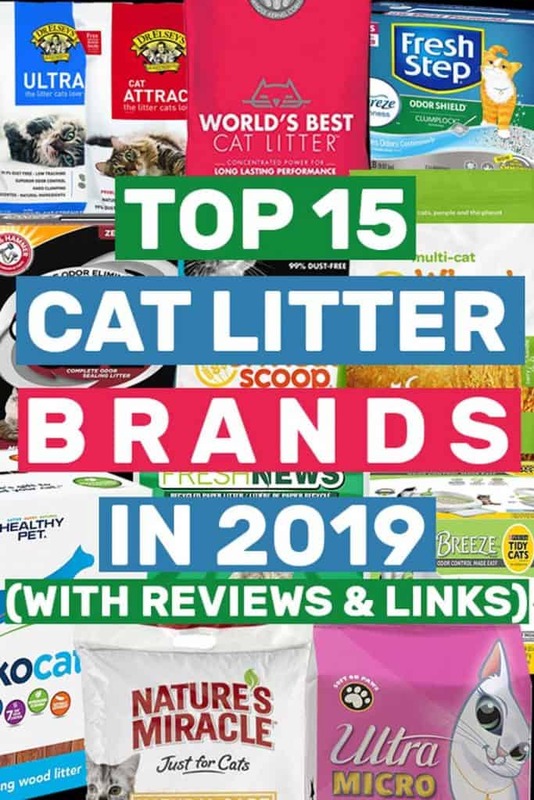 Keep reading to find out more about each of these brands and what their most popular types of cat litter are! Dr. Elsey’s Ultra cat litter is a clumping, dust-free, all-natural formula which is currently the number 1 best selling cat litter. If your cat is having problems using the litter box as often as she should, Dr. Elsey’s Cat Attract formula could solve that problem for you. It contains a blend of herbs that encourages cats to eliminate where they should. Although this company is better known for its baking soda and cleaning products, Arm&Hammer also has a line of cat litters. As you might have imagined, the focus of their cat litter is odor reduction and elimination. Arm&Hammer’s Platinum Clump & Seal formula does what its name says. It’s a clumping cat litter that seals in odors so you don’t have to worry about them for 7 days! Another dust-free formula from Arm&Hammer is their Platinum Slide cat litter. It’s designed to be non-stick so you don’t have to scrape it off the sides of the litter pan or the scoop. This top cat litter brand specializes in cat litter and other litter products, so it’s no surprise that they’ve nearly perfected the art of creating cat litter that works well for both cats and owners. Fresh Step has a few different formulas and types of litter, a couple of which we’re going to look at. 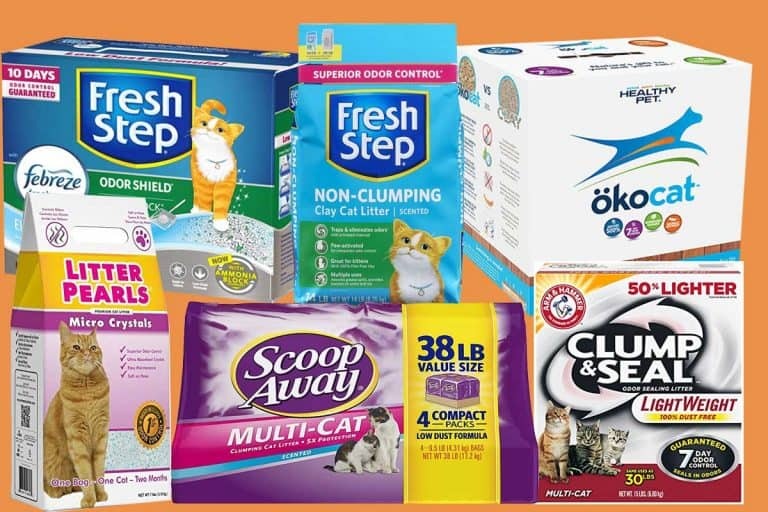 To create their Odor Shield cat litter, Fresh Step teamed up with Febreze. This litter is primarily made of a low-dust clumping clay litter, but also contains crystals which help trap and eliminate odors for up to 10 days. Some cats and humans don’t like the artificial odors produced by crystal cat litter, which is why you can also get the Fresh Step Ultra Unscented litter. It has the same tight clumping technology that makes cleaning easier. This company has a wide variety of pet products. 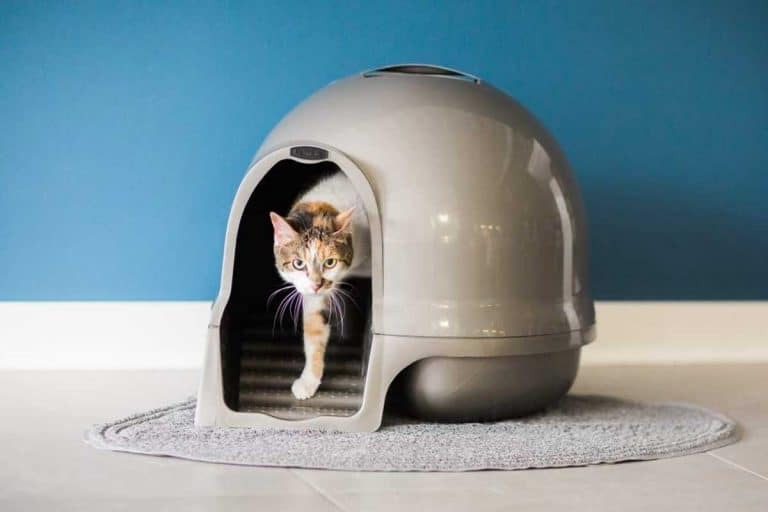 Its goal is to create products that will bring you and your pet closer together and their litter box system certainly does that. The PetSafe self-cleaning litter box system comes with blue crystal litter in disposable containers. Once the enclosed compartment is full, you can remove waste without having to come into contact with it, then replace the litter. Tidy Cats is a division of Purina, one of the largest producers of pet products in the world. As you can imagine, they have a number of cat litter formulas to choose from so you can find the one that works best for you. They hold many of the top spots on the best seller list which made it hard for us to pick ones to highlight. A favorite litter is the Tidy Cats LightWeight formula. It uses Glade tough odor solutions to fight odors for up to 2 weeks. Despite being lighter in weight than most clay litters, it has the same clumping ability as heavier options. Tidy Cats also has the Breeze Litter System. It’s a setup that allows you to add their special litter to the box. Liquids fall through the bottom and are absorbed into a disposable pad so the litter lasts longer than in most systems. This is the most popular of the natural cat litters, and it’s easy to see why. It’s made of corn kernels which are quick clumping and naturally odor-reducing. Some of their formulas also include other natural ingredients to enhance the smell. World’s Best Cat Litter multi-cat formula has all-natural plant materials added which help control odors. With two cats, a single bag can last up to 15 days, making it extremely cost effective. If you want to read about this type of cat litter, check out our post on the 8 types of biodegradable cat litter. 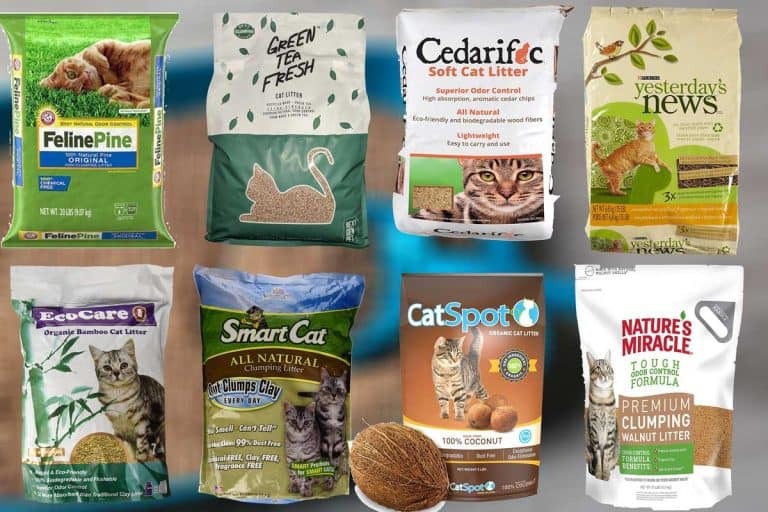 Nature’s Miracle markets its products as being for “life’s messes.” Although many of its products are for cleaning, it also has several cat litters to choose from. Keeping with its motto, Nature’s Miracle aims to contain messes with their litter formulas. Nature’s Miracle clumping formula is a traditional clay cat litter that’s fast clumping for easy cleanup. By clumping quickly, it locks in odor-causing substances to prevent foul odors. Another natural clumping litter, Nature’s Miracle Premium Corn Cob Litter turns waste into something usable, making it great for the environment! It also uses natural properties to control odors so it’s safe for animals. This company creates cat litter that’s “better for cats, people, and the environment.” Rather than using clay as a base which is harmful to the environment, it uses wheat. When wheat is ground up, the natural gluten and plant enzymes are exposed. These are what allows this litter to be clumping and odor-free. This is sWheat Scoop’s original cat litter formula. The fine grain is great for picky cats that are used to clay since it has a similar feel. However, it’s much safer for them since it doesn’t contain some of the dangerous chemicals that clay does. sWheat Scoop’s multi-cat formula is great for people with several feline friends. It has the same clumping abilities as the original formula plus offers better odor control thanks to added natural plant materials. This is another company that specializes in cat litter and that has a wide variety of options for cat owners to choose from. It’s undoubtedly this that keeps Ultra Pet as one of the most popular brands of cat litter. Ultra Micro Crystals are marketed as being “#1 in odor control,” and with the technology they use, it could be true. These small crystals trap odors but allow liquids to evaporate so that one bag will last one cat a full month. Better Way clumping cat litter is another formula created by Ultra. It has small granules that are soft on tender kitty paws and which prevent liquids from reaching the bottom so they won’t stick. If you decide to buy this, however, first read our article on whether or not you can flush cat litter. Ever Clean was the first company in the United States to make clumping cat litter and it won an award for “Best Product of the Year” just two years after it was founded. Its goal from the start has been to “make a positive impact on cat care.” Although they have several formulas, one stands out as being far more popular than the others. Ever Clean’s unscented extra strength formula comes in an ecologically-friendly package. It uses activated charcoal to trap odor-causing bacteria on contact. That means even the most sensitive feline nose won’t be offended by the litter box. Based out of Wisconsin, Smart Cat is a family-owned company with a range of products for cats. Their cat litter is all-natural and “out-clumps clay, every day.” It’s made with a combination of locally-grown grasses. The plant materials clump quickly and trap odors before they reach the air. Smart Cat’s all-natural clumping litter is also dust-free, chemical-free, and clay-free so it’s safe for cats. Plus, the soft granules are easy on even the most sensitive paws. When a company specializes in one type of litter, you can bet it’s going to be a great litter. Simply Pine is made from pine trees which are natural odor absorbers. The wood is processed into pellets which are over three times as absorbent as clay litter, so they last longer and can save you money on litter. As its name implies, Simply Pine cat litter is only made of pine. It’s also dust-free and low tracking so you don’t have to worry about your cat leaving litter all over the house. Plus, it’s completely biodegradable! ökocat has a small line of cat litters that are all wood-based. Each formula has the same advantages of all wood-based cat litters: super absorbent, great odor control, and lightweight. This company takes being environmentally-friendly to the next level as they source their materials from waste wood. Their most popular formula is ökocat’s clumping wood litter. It can absorb up to 500% of its own weight and a single 20-pound box can last for two and a half months with one cat. Plus, it’s lightweight which makes it easy to handle. ökocat’s super soft formula is great for cats that have sensitive paws. Like the regular formula, it’s clumping, has a 7-day odor control guarantee, and is made without any harmful chemicals. Whether you’re trying to save the planet or your money, Fresh News is a great option. It’s made with just two ingredients: recycled paper and baking soda. The paper absorbs liquids while the baking soda works to control odors. Although they have a couple of formulas, one is far more popular with cat owners. Because of how absorbent it is, Fresh News recycled paper litter can last twice as long as the same amount of clay cat litter, saving you tons of money. It’s a great option if you’re looking for a natural cat litter but are concerned about allergies since it’s completely dust- and allergen-free. Veterinarian-recommended and winner of Cat Fancy’s “Best Product of the Year” award, this clay cat litter has earned its spot on our list. Boxie Cat is made of premium clay and is virtually dust-free which makes it better for cats and the humans that clean their litter boxes. One of the biggest selling points of Boxie Cat’s scent-free cat litter is that it clumps instantly. This keeps urine clumps right at the top of the litter so you can easily scoop them out and avoid scraping them from the bottom of the pan. Want to Save Money on Cat Litter? No matter which of these 15 top brands of cat litter you choose from, you’re probably spending more than you could. To get the most out of your cat litter, there are some things you can do. Be sure to check out our article on 17 ways you can save on cat litter costs to learn more. Some of them are incredibly simple changes you can make today that can save you tons of cash in the long run!